It was an unusually weak spring for art auctions this year. What: Art auction house Sotheby's (NYSE:BID) saw its stock sink 16% during the month of August, according to S&P Capital IQ data. The drop has left shareholders with a 20% loss so far this year and an 11% fall over the past 52 weeks. Sotheby's is underperforming the market over both of those time frames. So what: Of course, the general stock market carnage in late August hurt shares, but the company also created its own negative sentiment with uninspiring quarterly results earlier in the month. 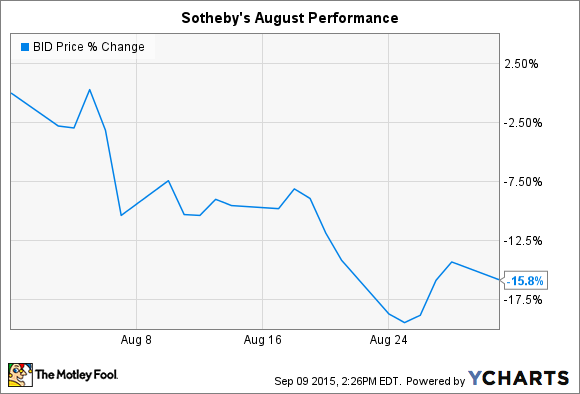 On Aug. 13, Sotheby's posted a 1% drop in second-quarter sales along with a 16% earnings dip. Both headline figures were worse than Wall Street was expecting. But the profit and sales drops can each be explained by temporary factors that shouldn't worry long-term investors. As for revenue, Sotheby's actually managed a solid sales increase of 3% after adjusting for foreign currency swings against the U.S. dollar. And on earnings, a calendar quirk pushed a large art auction event out of the second quarter this year and into the third, which simply shifted profits into the current quarter. Management was happy with the overall results despite the profit drop. Sotheby's "delivered strong sales to date in 2015 but some anomalies in the second quarter depressed the bottom line," CEO Tad Smith said in a press release. The executive team backed up their optimism with cash: They announced a new share repurchase program aimed at spending $125 million on buybacks in the next year or so. By comparison, the company spent just $25 million on its stock last year. Now what: Sotheby's broader business trends look healthy. Private sale commissions are up, as are auction commission margins. And the financial loan portfolio is seeing particularly strong growth, up 78% through the first six months of the year. That bigger portfolio has helped finance revenue roughly double to $25 million through the first two quarters of 2015. Overall, Wall Street seems to agree with management that the year will be much better than the second-quarter results would suggest. Earnings are projected to rise by 11% as sales improve by 3% in 2015.